The Ohio River continued to run near flood stage on Wednesday throughout the area, including here in Middleport near Dave Diles Park. Water from the Ohio River flows over the public use area near the Gallipolis City Park along First Avenue as the sun begins to set Wednesday evening. OHIO VALLEY — The sunshine returned on Wednesday afternoon, bringing with it a brighter forecast when it comes to river crest predictions across the area. On Wednesday, crest predictions were lowered from the previous day, from Belleville in Meigs County, south to to R.C. Byrd Locks and Dam in Gallia and Mason counties. 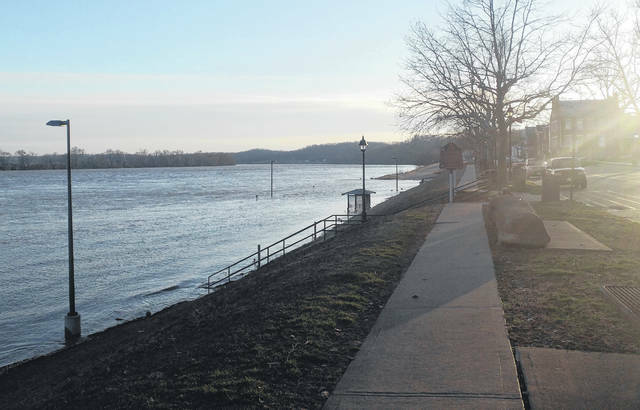 As of press time Wednesday, river crest predictions along the Ohio River, according to the National Weather Service, indicated the Ohio River would reach flood stage at Belleville and Point Pleasant, though high water will be seen throughout the readership area of Ohio Valley Publishing. Residents should exercise caution, particularly in areas prone to flooding. Belleville Locks and Dam, crest is now predicted at 35 feet today (Thursday). This is down from the previous prediction of 37.7 feet after cresting at 36.45 feet last weekend. Flood stage is at 35 feet. The water level was observed at 34.19 at press time Wednesday. Racine Locks and Dam, crest is predicted at 40.1 feet on Friday (down from the previous prediction of 43.9 feet) after cresting at 40.38 feet this past weekend. Flood stage is 41 feet at Racine. The water level was observed at 37.47 feet at press time Wednesday. 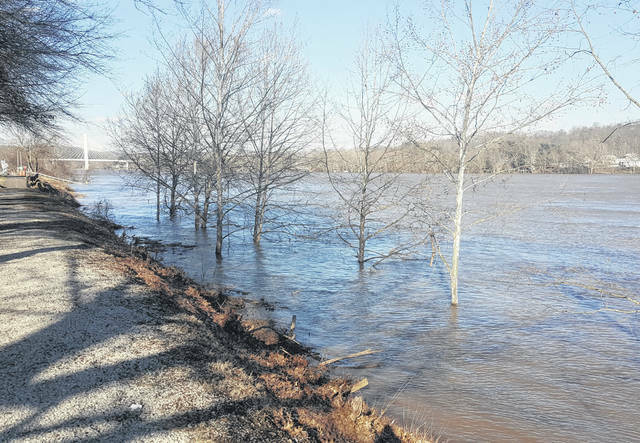 Pomeroy is estimated to crest at 43.7 feet on Friday, (down from the previous predication of 47.4 feet), after cresting at 43 feet last weekend. Flood stage is 46 feet. The water level was observed at 40.06 feet at press time on Wednesday. At Point Pleasant, the crest is predicted at 41.3 feet on Friday (down from the previous prediction of 43.7 feet), after cresting at 39.6 feet last weekend. Flood stage is 40 feet. The water level was observed at 37.9 feet at press time Wednesday. At R.C. Byrd Locks and Dam at Gallipolis Ferry and Eureka, the crest is predicted at 46.7 feet on Friday (down from the previous prediction of 49 feet), after cresting at 44.47 feet last Sunday. Flood stage is 50 feet. The water level was at 42.79 feet at press time Wednesday. Also the Gallia County Emergency Management Agency reported on Wednesday Raccoon Creek had “leveled off for the time being at 17.75 feet at Adamsville however it is still raising slowly in Vinton County.” Follow the Gallia County Emergency Management Agency on Facebook for updates on road closures and flooding issues in the area. Information provided by the National Weather Service.